The first week of school is tough. No matter how long you’ve lived somewhere before — a week, a month or a year — settling in, or back in, is never as simple as we wish it to be. I write this as I adjust my skirt to sit back down on the grass of the Tiergarten Park. I watch the silhouettes of my chatting and laughing friends, drinks in hand, against the beautiful marmalade sun dipping into the horizon. Its last rays of warmth gently caress their faces and bodies. The drinks start to get warmer and the air colder. I feel the first week’s stress melt away. Amongst Berlin’s graffiti and art-scape, its tall buildings and narrow doors, lies the scenic park culture. I’ve never seen a city so comfortable in its rush and chaos as in it’s calm and collected half. Every district in Berlin has luscious open spaces The city is built to accommodate your every need. Exhausted after a long day and tired of the hustle and bustle of the city? Park it up! Transport yourself to another time and place — there are so many parks to choose from! Tempelhofer Feld’s flat expanse is the perfect place to get away from the rush. For those of you who don’t yet know, Tempelhofer Feld served as an airport up until 2008 and even became a legend during the 1948/49 Berlin Blockade. Nowadays, it serves as a recreational space. Carry a book under your arm and watch as the sun sets into the flat horizon. Try to count all the colors in the sky! Last year, after a particularly exhausting day at the bank, I visited Tempelhofer Feld with a friend and fell so deeply in love with the green expanse and the setting sun that I forgot I had ever gone to the bank that day. It was just me, my friend, and the dipping sun for the longest time. I still cherish that memory. On your lunch break, but don’t want to eat at your usual spot? Pack a lunch basket, grab a friend, and have yourself a lovely picnic at Hasenheide Park! Hasenheide’s charming meadows alone are enough reason to visit, but if you’re willing to shell out some spare change, you can also walk around the rose gardens and settle down by the open air cinema. Have a day off from classes? Rent a bike and explore the beautiful Tiergarten, or simply spread out a blanket, settle down, and tan under the short lived sun! 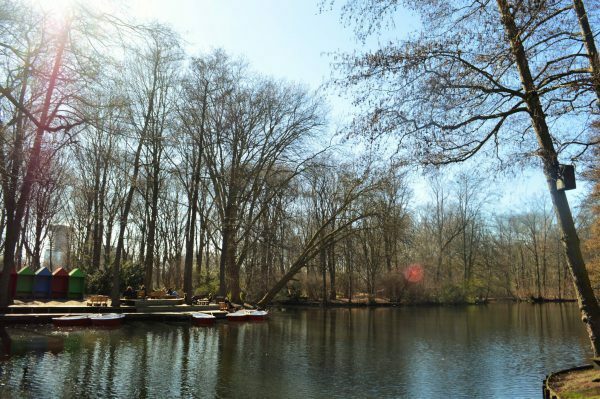 Tiergarten presents you with a lovely mix of nature and people; stunning open spaces and silent, secret spots. Whether you want to sit back under the shade of a tree with a snack or bike around the narrow paths, this is the place to be. Do you have friends and/or family coming over? Do you, like me, feel a desperate need to impress them with Berlin’s magnificence? Take them out for a relaxing evening at the Gleisdreieck Park, one of the most vibrant and colourful parks in Berlin. Here you can catch up on all the news from home, take a walk, or even throw a ball around. And if you’re ever feeling some Lord of the Rings nostalgia, hop on over to Bürgerpark in Pankow! It’s only a 5 minute tram ride from the dorms. Here you can spend your days getting lost in the Shire-like wonder that the park embodies. You can even climb trees — as long as they don’t catch you! When my friends outside of Berlin ask me what my perfect Friday evening in the city is like, they anticipate an answer referring to the famous night-life of Berlin. Sorry to disappoint, but, while that sort of thing is fun to do once in awhile, it’s no match for my perfect evenings in the parks. It’s hard to compete with the feeling of luscious green grass under your legs, the sound of melodious chatter from people around you, and the gentleness with which the wind blows strands of your hair back and forth. A park is your playground: You can finish off some homework, listen to music, have an outdoors brunch, or simply have some time for yourself! What a way to combat the hectic first-week-of-school chaos. There’s nothing more precious or intimate than being under the sky, sitting on the earth with the people and the things you love the most. It’s a dusky evening at Tiergarten, and the sun is beginning to sink lower into the horizon. Annie’s lovely laugh echoes against the rustling pages of my politics reading for next week. Nancy’s blonde hair adopts an amber hue under the setting sun. Her head bobs up and down gently as she memorizes German vocabulary. Paula and Emma chatter in rapid Spanish against the whistling wind, while Acacia and Farah quietly turn pages of their Renaissance Florence’s Boccaccio readings. Parks make getting back into the school rhythm of homework so much easier. In the soft green grass under the setting sun, I feel the stress ebbing away. I re-adjust myself and turn to the next page of my book, settling in for an exciting new semester. Seriously — go to a park. Go to ten. It works.